5,591 backers pledged $581,673 to help bring this project to life. Your Best Game Ever is divided into three major sections: general game topics, being a player, and being a game master. There’s even a section on designing your own game, and getting it published. And this isn’t just a stuffy book on theory, either. You’ll find actual suggestions you can use to create better characters with character arcs, real recipes you can make for game night (and even spruce them up for your genre of choice), specific suggestions for music and ambiance depending on genre, plot ideas, character ideas, and other ready-to-use material. This 240-page book will enable you to become a better gamer. You’ll find ways to create and manage a great game group, tricks for game prep (and what to do if you haven’t prepared! ), understanding and managing game balance, and taking everything around you and incorporating it as inspiration for your game. In 2011, Monte created Numenera, and with it, a game system called the Cypher System. This game system has won awards and has been lauded by gamers everywhere as a wonderfully different way to play games of any genre. In 2015, we created the Cypher System Rulebook (CSR) to help gamers use the system for any type of game they wanted to play—fantasy, science fiction, horror, superheroes, and so on. You can get a copy of that book in this Kickstarter campaign, but we’re also Kickstarting a new version that will come out in 2019. The new version will incorporate lots of new options for players, but perhaps best of all it will take the concepts from Your Best Game Ever and apply them directly to the Cypher System. These two books will work hand-in-hand to create the best Cypher game ever! If you're new to the Cypher System and are curious about how it works, you can download the free Cypher System Rules Primer for an idea of how the game plays. Now that the Kickstarter has funded, our stretch goals will focus on the development of various genre-focused books that will take the concepts found in the new CSR and take them one step further, with specific examples. Each of these additional books will include an entirely new and original campaign setting as well as lots of material and advice for making your own in the realms of science fiction, fantasy, and more. When we were finishing the new Numenera books, Discovery and Destiny, one of the first things that playtesters asked us was, are you going to incorporate some of the cool new material in these books into the Cypher System? A valid question. And it got me (Monte) really thinking about the Cypher System Rulebook as a whole. I didn’t want to change the rules—I love the Cypher System, and wouldn’t touch the mechanics. But developing Numenera Discovery and Destiny showed me that there was a lot we could add in terms of player abilities and flexibility, and what the CSR really needs is flexibility. The idea that you can create any campaign in any genre is fundamental to the whole idea. And I realized we could take some steps to push that idea a lot further. So we’re Kickstarting a brand new, revised 416-page Cypher System Rulebook. Before I go any further, though, let me say right now, if you’ve got the existing Cypher System Rulebook and you’re happy with it, great! These new ideas don’t change the way the rules work. You still roll a d20, you’ve still got difficulties 1⎼10, you’ve still got characters with descriptors, types, and foci. NPCs have levels. PCs use effort to decrease the difficulty. Everything is still fully compatible with everything Cypher-related that we’ve ever published. You’ll be able to play a game with half the characters from the original CSR and half from the new CSR all at the table at the same time. The difference isn’t in how the game is played, but in the choices players get to create and run their characters. What I’m most excited about are the ways I’ve thought about over the last few years to make things more customizable so that you could even more easily use these rules in any setting. To that end, in this book we’re dramatically streamlining the chapter on character focus, so that you can customize your character’s focus to perfectly match the setting and your character concept. So if you’re making a starship pilot, a superhero, or an occult investigator, you don’t choose the one that fits best from a list of foci—you take your character concept and tailor your focus so that it really fits what you want to do. Based on player feedback, we’re also making what we call subtle cyphers—cyphers that aren’t tied to a specific object—the default for all genres, and we’ll be including way more of them. (You’ll still be able to have cyphers as objects too.) This will make applying the concept of cyphers, which is obviously core to the system, easy no matter what kind of game you’re playing. And of course, there’s all those new additions from Numenera Discovery and Destiny that add a lot of new options that just make the game better. They’re not really changes, they’re additions—new character abilities, more choices, player intrusions in addition to GM intrusions, and more. These will all be incorporated into the new CSR. And let me say again, it’s still all entirely compatible with existing Cypher System material, whether it be from the CSR or one of our settings like Gods of the Fall, Predation, or Unmasked (and of course, Numenera and The Strange). Further, we’ll also be incorporating suggestions from Your Best Game Ever directly into this book. So, for example, Your Best Game Ever will talk about creating character arcs to enhance play, while the specific material for creating Cypher System character arcs as a mechanic will be included in this book. Lastly, we’ll include even more genres you can use, in addition to fantasy, horror, and so on. We’re going to break science fiction into hard sci-fi and space opera/science fantasy, and we’ll add coverage for romance, historical gaming, and more! Learn more about the changes we're planning to make here. Your Best Game Ever: This 240-page beautiful hardcover book is suitable for your coffee table as well as your game table! Decades of gaming advice and insight all in one tome. If you love RPGs, you need this book. Also available as a PDF. Cypher System Rulebook: This 432-page, lavishly illustrated, hardcover corebook is fully compatible with the original Cypher System Rulebook, and all Cypher System products like Numenera, The Strange, Gods of the Fall, Predation, and Unmasked! It contains everything you need to play a Cypher System game of your own. Also available as a PDF. The Stars are Fire: We delve into the realms of science fiction in this 224-page hardcover book that provides rules, suggestions, and ideas for Cypher System sci-fi games, and includes an entire brand new science fiction setting ready to use. The Stars are Fire covers technology, characters, creatures, starships, and more! Includes a double-sized poster map! Stay Alive! : The official hardcover guide to horror gaming for the Cypher System with 224 pages of rules, suggestions, and ideas—plus of course characters and creatures to terrify players! Stay Alive! is also an entirely new horror survival setting, full of surprises, and ready to use. Includes a double-sized poster map! Godforsaken: A 224-page fantasy hardcover sourcebook and complete setting all in one! You’ll find rules and guidance for running a Cypher System fantasy campaign, characters and creatures to use in your game, and an entire, ready-to-use fantasy setting. Includes a double-sized poster map! We are All Mad Here. This 224-page book of madness and mythic magic will be filled with advice, creatures, adventures, and a whole new, ready-to-play setting by Shanna Germain. Includes a double-sized poster map! The BEST RETAILER EVER! level is a flexible way for you to decide how many copies of Your Best Game Ever and related products are right for your store, and to avoid tying up your cash between now and release. Your pledge is a down payment for an order to be placed, at a retail-friendly discount, when Your Best Game Ever and the revised Cypher System Rulebook are ready to ship. You can choose as many copies as you like of the books individually. You’ll pay for your order (less your $80 deposit) at that time. It is likely (but not guaranteed) that you will get them ahead of street date, and you are welcome to begin selling them immediately. In addition to those books, you get a free deluxe Your Best Game Ever PoP kit. MCG covers domestic US shipping. You might be wondering, “How do I select an add-on?” It’s easy. Select the Manage Your Pledge button on the right-hand side of the Kickstarter page and increase your pledge for the amount listed for the add-on. For example, if you want Early Playtest Access, add $100 to your pledge. It’s that easy. After the campaign closes, we’ll be using a service called Backerkit to collect your information, and at that time you can specify the add-on that you’ve already paid for. Why does Monte Cook Games use Kickstarter to fund so many of its projects? In a word, you. You're reading this right now on Kickstarter because you're an invested game fan interested in what's new and innovative in gaming—and thus you're exactly who we write our products for. If MCG were a company that made its way by publishing just another adventure or just another sourcebook every few months, we would have a hard time justifying Kickstarter. But that isn't our passion. Our passion is innovation and creation, but that requires up-front capital and—probably even more importantly—a test of the audience to determine if our ideas meet people's needs and wants. Kickstarter provides us with that. In turn, it puts us in a position to reward those early adopters with great deals, early access, and transparency. We think it's a win-win for everyone. But we use traditional sales channels as well, so if you'd like to check out some of our other products, like Numenera, The Strange, or Invisible Sun, you can go to our online store or visit your favorite local game retailer. Soon after the Your Best Game Ever Kickstarter campaign ends, we will invite you to review your pledge on BackerKit. This allows you to confirm your pledge and add anything that you might have missed. While we use BackerKit to organize backers, pledges, and add-ons, we don’t fulfill rewards through them. Instead, your rewards from this Kickstarter campaign will be fulfilled through the MCG Shop, which puts you, the backer, in charge of redeeming them at your convenience. Here’s how it works: when your rewards are ready, we’ll notify you by email to check your MCG Shop account, which will be updated with coupons that let you redeem your rewards for free through our online store. You decide when to use the coupon, at which time we'll ask you to provide or update your shipping address. If you have multiple rewards coming, you may delay redemption of your rewards to bundle them together into one shipment to save on shipping costs. We guarantee a product will be in stock for you as one of your rewards for at least one year after the product's release date. This applies to all methods of shipping described below. If you move between reward shipments, you won’t need to tell us, since you’ll simply enter your new address the next time you redeem a reward. If this is a gift and you want to ship it directly to the recipient, simply enter the recipient’s shipping address as the Ship To address when you redeem your reward. DOMESTIC SHIPPING We offer USPS basic shipping within the United States for free. If you’re super-eager to get your rewards, you can upgrade to a higher shipping class, but you’ll be charged accordingly at the time of fulfillment. SHIPPING WITHIN THE UNITED KINGDOM, EUROPE, AUSTRALIA, AND NEW ZEALAND Your reward will be filled by our shipping center in the UK. The cost of shipping is not included in your pledge—it will be an additional charge for you. However, it will be much less expensive than paying for shipping from the US to you. The UK shipping center ships to the following countries: Austria, Australia, Belgium, Bulgaria, Croatia, Republic of Cyprus, Czech Republic, Denmark, Estonia, Finland, France, Germany, Greece, Hungary, Ireland, Italy, Latvia, Lithuania, Luxembourg, Malta, The Netherlands, New Zealand, Norway, Poland, Portugal, Romania, Russia, Slovakia, Slovenia, Spain, Sweden, Switzerland, and the United Kingdom. International shipping is expensive. We don’t have any control over that, and we can’t accurately predict what shipping rates will be at the time of fulfillment. If you’re an international backer and have questions about shipping rates, we recommend you visit the USPS website to get an estimate. Please also be aware that you are responsible for import duties, taxes, and brokerage fees, and that we must comply with international law and cannot mark your reward as a gift or as a zero-value item. If you have multiple items coming as rewards, you can mitigate shipping costs by waiting to have several of them shipped together. We guarantee that each reward will be available for a minimum period of one year from its official release date. To ease the burden of international shipping costs, we subsidize all non-UK/Europe international customer orders and backer reward fulfillment orders with a $10 discount. You’ll pay the shipping costs at the time of fulfillment, minus the $10 discount, which is automagically (and invisibly) applied through the inner workings of the MCG Shop (you won’t see the discount reflected on your order, but it is applied to all international orders outside of the UK/Europe). In other words, if the cost to ship the parcel to you is $62 USD, you’ll pay $52 USD. The $10 shipping discount is applied once per parcel, not per item. This is the twelfth Kickstarter campaign for Monte Cook Games. All of our previous campaigns have been successful and jam-packed with rewards. Most of those campaigns are completely fulfilled, and we have a strong record for fulfilling rewards on time—we’ve delivered over 250,000 rewards to date. These include such varied items as corebooks for Numenera and The Strange, leather-bound deluxe corebooks, boxed sets, almost two-dozen hardcover supplements, signed bookplates, playtest access, special-access seminars, meetings and dinners with the creative team, online and in-person games, and so much more. Thus, while there are always challenges that can arise, we've probably already faced them. We are extremely proud of our track record. There’s been bumps on the road, but what are roads without bumps? We're confident that the project will meet all its promises. You get a copy of Your Best Game Ever in PDF. You’re well on your way to gaming fun. Free domestic (US) shipping, UK/EU friendly shipping, and $10 off international shipping. 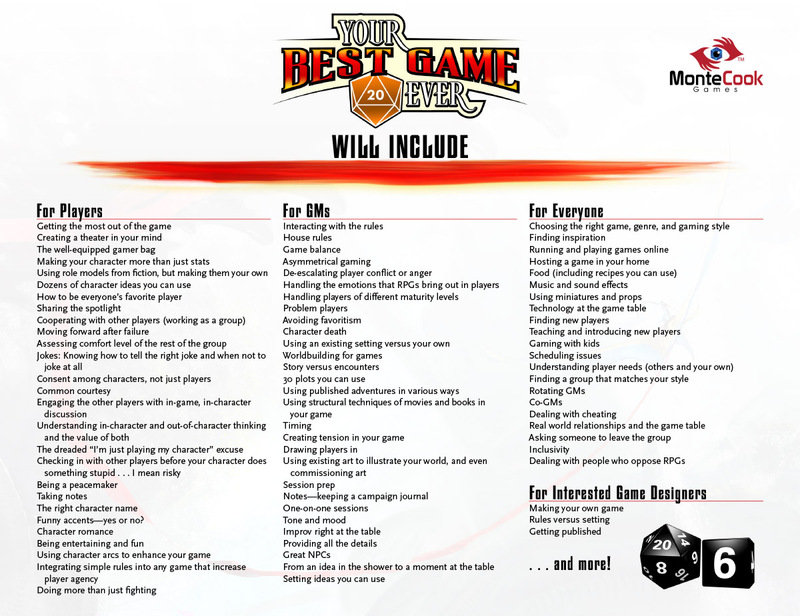 You get both Your Best Game Ever and the revised Cypher System Rulebook in PDF. It’s a fantastic start. You get a copy of Your Best Game Ever in print as a beautiful hardcover book. You also get the book in PDF. This is going to be awesome. You get a copy of the revised Cypher System Rulebook as a gorgeous hardcover rulebook. You also get the book in PDF. Cool! You get a copy of Your Best Game Ever and the revised Cypher System Rulebook in print as fantastic hardcover books. You also get the books in PDF. This is the real deal. You get both Your Best Game Ever and the revised Cypher System Rulebook in PDF. But there’s more. You’ll get the books and other products unlocked by reaching stretch goals in PDF format. And we have plans for some cool stuff. You get a copy of Your Best Game Ever and the revised Cypher System Rulebook in print as fantastic hardcover books. You also get the books in PDF. But they don’t come out until next year, so we’ll send you a copy of the current 416-page, hardcover, gorgeous Cypher System Rulebook in both print and PDF to get you started as soon as this campaign closes! You get a copy of Your Best Game Ever and the revised Cypher System Rulebook in print as fantastic hardcover books. You also get the books in PDF. But that’s not all. You get all the books and other products unlocked by reaching stretch goals. Print and PDF, my friend. If this campaign unlocks it, you get it! You get a copy of Your Best Game Ever and the revised Cypher System Rulebook in print as fantastic hardcover books. You also get the books in PDF. Plus, we’ll send you a copy of the current 416-page, hardcover, gorgeous Cypher System Rulebook in both PDF and print to get you started as soon as this campaign closes. But wait—we’ll also throw in absolutely everything unlocked through stretch goals in this campaign. I Want it All and I Want My Say! You get a copy of Your Best Game Ever and the revised Cypher System Rulebook in print as fantastic hardcover books. You also get the books in PDF. But that's not all. We’ll also throw in absolutely everything unlocked through stretch goals in this campaign. But wait—you'll also get all your books signed by the entire MCG design team, plus you'll get early access to all the materials at the same time that our playtesters get it and can contribute playtesting feedback if you like.